Home / 2D animation / Cartoon Saloon / CP / news / trailers / UK & Ireland / Web & Independent Animation / GKIDS Releases 'Song Of The Sea' US Trailer. GKIDS Releases 'Song Of The Sea' US Trailer. The US release of Tomm Moore's Song Of The Sea draws ever closer. Riding high on some phenomenal reviews following screenings in Toronto, London and L.A, it's even being already touted as an Oscar contender (and not just by us). With the film set to open in the US and Canada on December 19th, North American distributor GKIDS Films has released a stunning new trailer. 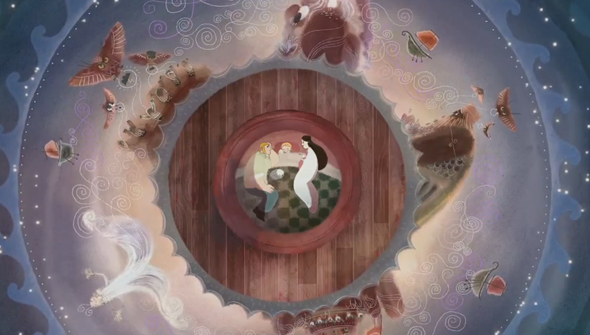 Song Of The Sea comes from Ireland's Cartoon Saloon, and is Moore's second feature following The Secret Of Kells (co-directed with Nora Twomey). The new trailer gives us the best look yet at the gorgeous traditionally animated film, which tells a story steeped in traditional Celtic folklore. When writing about the first trailer we compared the footage to Studio Ghibli, and now we've seen even more, the comparison seems more apt than ever. Song Of The Sea will be released in Ireland and the UK in early 2015.